VELO CHIC CLUJ is an annual free event held in Cluj-Napoca, Romania. The event has been organized since 2015 by the “Napoca” Cycling Club (CCN), under the umbrella of the Romanian Cyclists Federation (FRC). 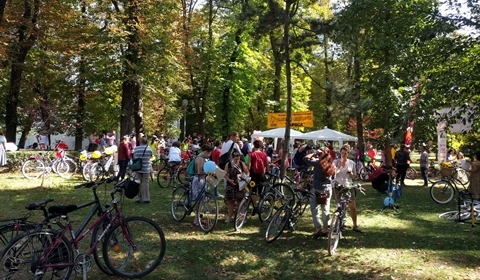 It is a complementary event to other CCN actions—such as lobbying and monthly cyclists’ marches in downtown Cluj-Napoca—to promote the use of bicycles in Cluj-Napoca and its metropolitan area. 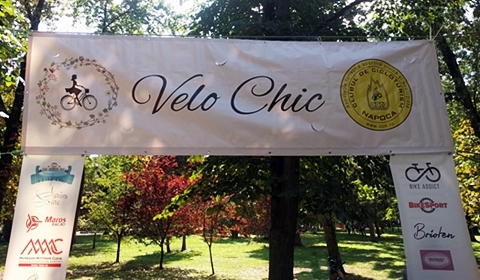 Related to past editions, with the first edition in my city taking place in 2008, Velo Chic is in good company with sister campaigns in major cities of Romania, such as Elegant on the Bike and VeloBello (now known as “Skirt Bike“). 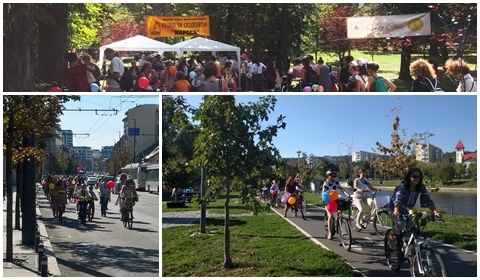 Velo Chic Cluj 2018 garnered over 100 participants of all ages, most of whom were women but also a few men. I am proud to consider myself one of the ladies for whom the bicycle has become a natural choice as a means of daily transport in the city and its metropolitan area. Like other participants, I believe it’s worth demonstrating that cycling is not only for exercise and sport but can also be synonymous with elegance and femininity. In keeping with the spirit of the event, the majority of women participants dressed in elegant and natural styles. Whether in skirts, dresses or pants, whether we chose heels, ballerinas or boots, and whether or not we wore hats or scarves, we were promoting an active, healthy lifestyle—one that is at the same time better for the environment. 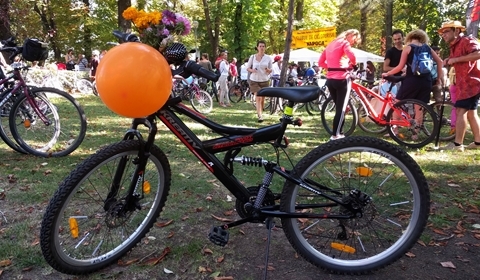 We brought our bikes already adorned with flowers, bows and balloons or opted to decorate them in the park among the other cyclists in their chic outfits. 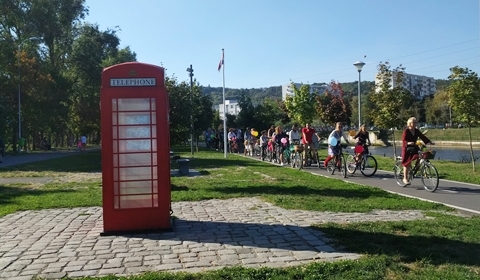 The organizers started this march because they’re convinced that, besides attending a pleasant social and lifestyle event, participants can also be ambassadors of cycling in the eye of local authorities, the media and the public. 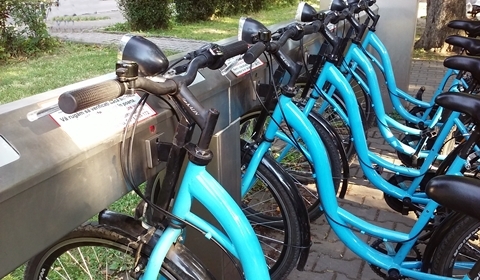 We can draw attention to the current situation of bicycle lanes and the existing bicycle infrastructure. 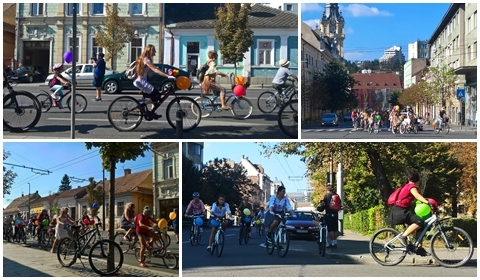 We can cycle to support the wider context of urban infrastructure to optimize safety and efficiency, which is still lacking in many cities of Romania. Beyond infrastructure deficiencies, which makes the use of bikes in some areas of the city and its metropolitan area uncomfortable or even unsafe, there are prejudice issues that still feed a less favorable image of cyclists in general, and of elegant bikers in particular. Sadly, local authorities not fully supporting this means of transport doesn’t help. The 2018 event began in the sun-soaked ambiance of „Simion Barnutiu” Central Park, with a pleasant musical background and an atmosphere of enthusiasm. 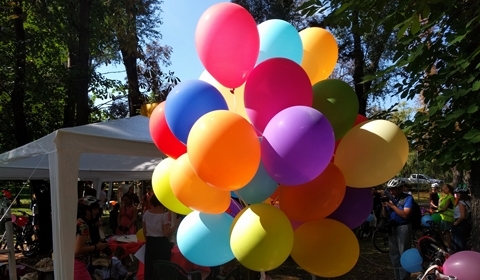 Organizers welcomed us with flowers and balloons with which to decorate our bikes, water and snacks, and on-the-spot help with safety checks and small adjustments or repairs for bikes. Bicycle gifts from sponsors were distributed in tote bags imprinted with the Velo Chic logo. Gifts included reflective leg snap bands, water bottles, rain-cloaks, stickers, a warm welcome letter and informative materials, such as the bicycle road traffic laws now in effect from our lobbying and useful advice for cycling safely. 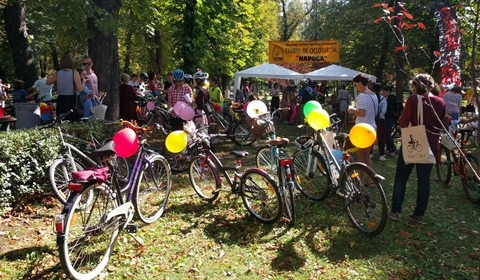 This year’s edition of Velo Chic took place on a gorgeous Sunday in autumn. A warm wind accompanied us on our almost two-hour, 9,6 km-long march (according to my Strava cycling tracker,) starting and ending in Central Park against a backdrop of horse chestnut trees. 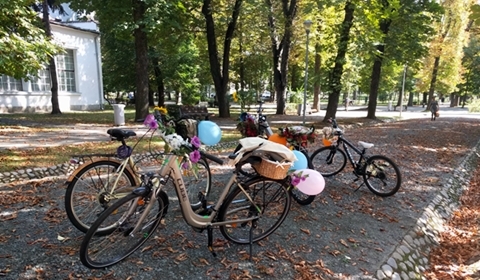 This was truly a promenade of feminine elegance on two wheels, with smiling women adding a pop of extra color at the turning of seasons to the streets of downtown Cluj-Napoca. Since I live outside of the city, my cycling for the day came to a total of 36,5 km, including my ride into the city and back home. A 15-minute break was scheduled for Union Square. This was where all participants had a chance to catch up with the cycling column, which had become fragmented at various points due to stop lights and intersections. During the break we watched several minutes of a puppet show on a stage set up in the square for a kids’ event, hence the balloons present in the square. Those who didn’t have a bike of their own participated with a bike from ClujBike, Cluj-Napoca’s free bike-sharing system which runs during spring and mid-to-late-autumn (depending when the temperature turns to freezing). Those who opted for such a bike had the opportunity to park it at a ClujBike station nearby the square during our break. This way it stayed free and could then be picked up again for a new hour of pedaling. I loved the event, it was so much fun—even better than last year when I had to leave halfway through for another engagement. My boyfriend accompanied me and during the march he zig-zagged on his own bike across downtown, capturing photos of this chic and graceful promenade. At the end, there was a raffle with the main prize of a bike basket. Participants hung out for a while longer to enjoy the afternoon, and to chat and exchange experiences about cycling in the city, about opportunities, problems and solutions, all sharing our different perspectives. 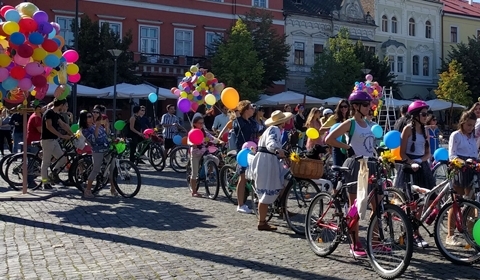 The women attending Velo Chic Cluj 2018 brought beauty and smiles, and an air of courage, hope and trust hope to this event, which I believe helped in surpassing any fears one might have about pedaling in the city. 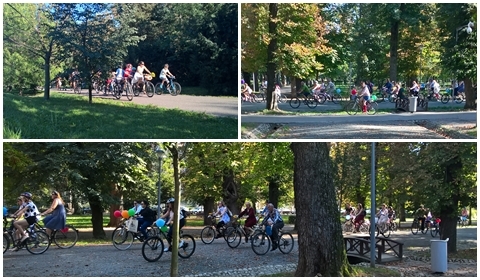 Among flowers and excitement, we proved that femininity exists on two wheels, and pedaling is fun in chic outfits, too! Hopefully the image of an elegantly-dressed biker is on its way to becoming a more widespread sight, and drivers will become even more aware and respectful of us.